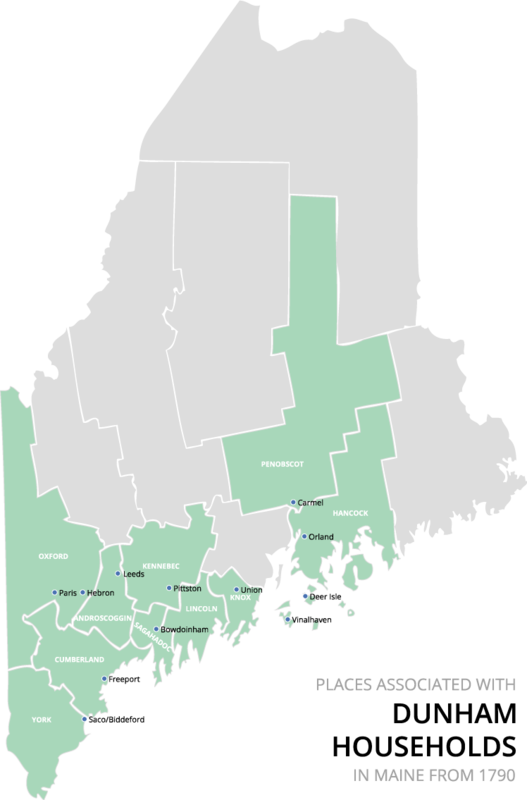 There were 13 Dunham households in Maine recorded in the first United States Federal Census in 1790. One of these households must have been the family of James Dunham Jr. (~1788-1863) of Orland, Hancock County, Maine, my third great-grandfather. This post is one of a series to understand each of these Dunham families. 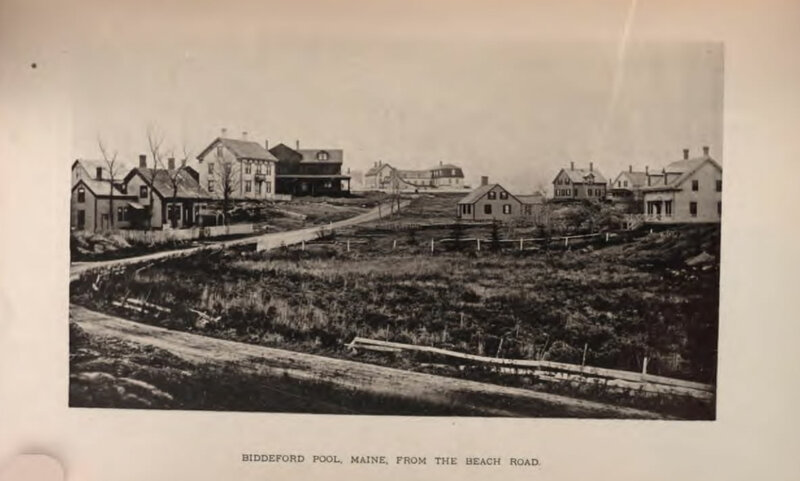 Biddeford had a population of 1,018 in 1790, according to the first federal census of the United States as required by the 1789 Constitution. The town was incorporated in 1728, but its twin city Saco, originally named Pepperellborough, is one of the oldest European settlements in Maine; the first Europeans landed in the area in 1616 and it was settled by 1631. There being no other Dunham household in Biddeford in 1790, we can reconstruct Joseph’s family according to various records. Thus we can identify the family members corresponding to the census numbers (documentation provided in the register section below). * The estimated ages/birthdates of Joseph and Miriam are based on the age groupings of their 1800 census records. Those unfamiliar with pre-1850 U. S. censuses may be surprised to learn that only the names of the heads of households — virtually always men — were recorded. Women, children and slaves were merely numbers. Maine residents were not slaveholders, so I have omitted the slave tally because it was in all cases empty. The compiled family register follows. 3. John Dunham (Joseph1). Born on 21 Oct 1782 in York, York,Maine.21 John died on 23 Dec 1845; he was 63.22 According to the death record of his son Rufus, John was a ship builder. Born abt 1838. Lyman F. died on 22 Dec 1845; he was 7. Born abt 1840. Emmaline C. died on 17 Sep 1841; she was 1. Born abt 1847. Lyman F. died on 29 Aug 1850; he was 3. Born abt 1848. Rufus W. died on 30 Aug 1850; he was 2. Born in 1856. Arthur died on 8 Jan 1857; he was 1. Born abt 1857. Emeline Grace died on 30 Aug 1859; she was 2. Could James Dunham Jr. have been a member of this family? It’s unlikely. First of all, we can presume that the 1790 census record for this family would be accurate because Humphrey Pike, whose nephews Humphrey and Israel would marry Joseph’s daughters Mary and Hephzibah, was a census marshall for York County.44 So it does appear these families were close. Humphrey Pike would probably have noticed if any detail about the Dunhams was omitted. That would have included missing a young son named James. If there were an omission in the 1790 census, one might assume we could find it correct it in the subsequent census of 1800. But the only additional family member listed there is a young boy, whose name we do not know. Males under 10 1 ? ? ? Hephzibah, then aged 18, was not listed among the family because she had married Israel Pike two years before the census enumeration. Joseph Jr., of course, had died four years prior. John should be 17 or 18 at this time (depending on the date of the enumerator’s visit); he would likely not have left the family until he married Hannah Emery in 1809. So did the enumerator make an error, putting the number in the wrong column? Who was the boy under 10? Was the male over 45 Joseph’s father, or a relative with his own son under 10 years of age? These are all interesting questions, but none of them suggest that a 12- to13-year-old James Dunham Jr. was a member of this household, who would move alone 140 miles to Orland, a place where he had no family. Please refer to www.dunham-singletary.org and follow the line of Deacon John1 Dunham, Joseph2, Nathaniel3, Ichabod4 Dunham and note the children listed include Jeremiah5 Dunham born before 21 January 1727/8 when his parents Ichabod and Mary Dunnam were received to full communion by the Church at Wells, Maine. The record states “also Jeremiah, son of Ichabod and Mary Dunnam”. Maine Marriages, 1771-1907 database from Family Search.org give the marriage of Jeremiah Dunham to Anna Frost 4 Feb. 1749 in Wells, York County, Maine. While there is no Vital Record to prove the birth of Joseph Dunham about 1750, the circumstantial evidence is very strong that Jeremiah and Anna (Frost) Dunham were the parents of Joseph6 Dunham, the subject of the above article.